Zot the Wizard and his familiar Pooky are the brains of The Party. Find out how the two met! Zot was a very clever boy who was fortunate to be born into a family with means. His parents provided him with the opportunity to pursue intellectual pursuits while at the same time discouraged other silly things like sword fighting or menial work. This suited Zot just fine as he had a mind for the arcane and was performing minor cantrips before he was even enrolled into the illustrious Mage’s Collegium of Greyport. While his raw talent was impressive, it was his dedication to his studies which set him apart from his peers. Zot threw himself into the academic study and implementation of magic, delving deep into the science of the arcane. He swiftly rose to the top of his class, perfectly melding natural talent with dedicated practice and insightful spellcraft. The Collegium of Greyport housed a marvelous library of artifacts. And students in their last year of study were expected to take part in an expedition to locate new treasures and earn themselves some real world experience. That was how Zot was first acquainted with the ever-kind priestess Deirdre. The wizards who organized these excursions were no fools, and always employed a handful of warriors and divine healers to keep the inexperienced mages safe. Deirdre was always happy to lend a hand on these trips, ensuring that everyone came back, quite literally, in one piece. Zot despised the trip. He always preferred his books and research – not to mention warm food and a bed! Getting muddy, sweaty, and improvising his spellcraft just felt so barbaric. However, even through these “hardships” Zot rose to the occasion. The experience thrust him to leadership positions and showed that he could think and cast on his feet. Zot, though he hated to admit it, proved to be very capable on an adventure. Traditionally, last years at the Collegium would perform a Binding Ritual to focus their power. Many students chose to enchant a staff or wand, entrusting their power to a simple Ritual with predictable results. Summoning familiars could provide a wizard with greater power, but it meant bonding to a living, breathing thing. If the creature summoned was not agreeable it could be disposed of… but doing so carried a hefty toll that would drain a wizard of their power for months, if not permanently. Zot had always fancied the idea of a familiar. He longed for something like a wise owl, a noble horse, or perhaps even an elusive pseudo-dragon – a permanent companion worthy of his power and stature. Zot spent over a year preparing the spell and collecting the best components he could acquire for the Finding Ritual. Zot performed the Finding Ritual in the Collegium summoning room. The materials he had earned were impressive, especially so for an untitled wizard. He was certain that he had done everything possible to maximize the range and effectiveness of the magic to ensure that he would find a familiar he would be proud of. As the materials shimmered and melded, evaporating into the Æther, the elder wizards who watched all agreed that Zot performed the ritual flawlessly. Now all he needed to do was wait. The wait was not long, as is typical for these sorts of things, and through the cracked door to the chamber hopped a small white bunny rabbit. “Something must have gone wrong,” thought Zot. “I suppose, I’ll need to kill the poor thing and try again.” But he couldn’t, the loss of power would interrupt his studies and that would not do! “I’ll just need to wait till I finish the year. Then I can start working on a new familiar,” Zot sighed in defeat. There was nothing for it. He was simply stuck with the bunny until at least the end of the term. He went back to his studies doing his best to avoid the jeers of his colleagues who loved to remind him how cute, fluffy, and adorable Pooky was. Pooky’s behavior exacerbated matters. As the weeks went on Zot discovered that Pooky had a natural talent for getting into mischief and raising a ruckus. While Pooky did not appear to resent being bossed around by Zot, he certainly didn’t follow directions very closely. The bunny seemed to delight in getting into worse and worse trouble. Then things started to get strange, when Pooky clawed his way through Zot’s dormitory door and gnawed his way through the parapet gate. That evening a number of the messenger ravens went missing with nothing but feathers and bones to show that they had ever been there. To Zot’s surprise, finals week came and went in a rush of immense pleasure. Pooky seemed to revel in the challenges, genuinely enjoying each and every trial better than the last. The wizard and his familiar were finally a team, and the pair mastered every situation into which they were thrown. Together, they even invented solutions to problems nobody had thought of before. By the end of the tests, Zot and Pooky had earned perfect marks. Disaster struck just before the titling ceremony. A great beast attacked from the west, its massive wings beating up a hurricane and its glowing maw belching forth hellfire. An ancient dragon had swept down from the mountains, lighting buildings ablaze and ripping through roofs with his claws. Wizards, untitled and grand, fought to delay the dragon’s assault while the Archmage set to work. The Collegium library contained a vast collection of lore and artifacts and, as the rampage continued, it became obvious that there would be no time to move them from the city before the great wyrm would break through the Collegium’s defenses. So, instead of rescuing the arcane treasures, the Archmage ordered all of the wizards to evacuate while she set to work locking the Collegium out of time. The stasis ritual had already begun when Zot was chasing Pooky throughout the Collegium. Zot and Pooky had been summoning forth magical protections from the high towers of the Collegium when the call to evacuate went out. 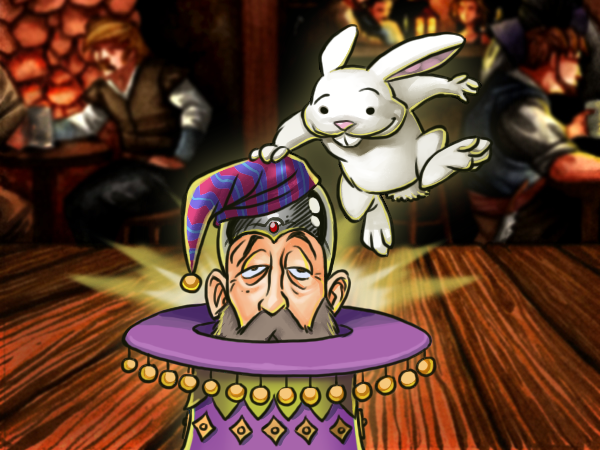 Pooky would have none of it and instead the little white rabbit bounded towards the middle of the Collegium. Zot was furious. It was bad enough that Pooky had run off in the middle of the fight, but if he got trapped in the Archmage’s ritual then Zot’s power was going to be bound to this one location for as long as the stasis lasted! But he couldn’t bring himself to turn away from the Collegium, “Have I actually come to care about that little troublemaker?” Teetering on his heels for too long, he realized the truth and rushed back into the Collegium. Using his connection to Pooky, he was able to locate his familiar in short order. “If you don’t stop right now, we’re both going to be trapped in here!” Zot yelled as he chased after the rabbit, deeper and deeper into the vaults of the Collegium. “Because you are conscious,” came an unfamiliar voice into Zot’s head, “You are bound to me. And that gives you some advantages.” Pooky started to wiggle, as if he was caught in a tight jacket and was wriggling his way out of it. Before too long, Pooky fell to the floor, stood up on his hind legs, and dusted himself off. “How did… you… But…” Zot’s mind was racing. What was Pooky?! “Pooky,” thought Zot in an aggravated tone.